Note that much larger versions of all of these photos (up to 5000 pixels wide for the panoramas) are available if you click on them. 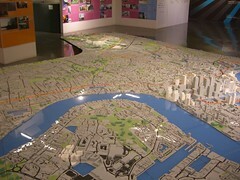 Last weekend, we went to New London Architecture to see the exhibition of plans for London transport. The exhibition had nothing you couldn't get from the excellent downloadable catalogue. 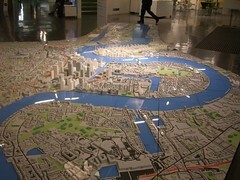 But their permanent 1400:1 scale model of London is awesome. Beige buildings exist now, white ones have got planning permission but not yet been built. 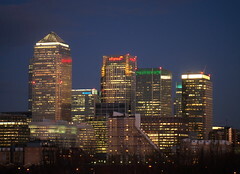 Here's the view from Rotherhithe east to Docklands, Greenwich and City Airport. 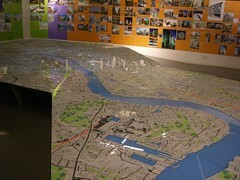 This one is looking north and a bit east towards the Lea Valley and the Olympic site. And here's the view west towards the City and the West End. Now, courtesy of the new camera's automatic panorama stitching, here are some of those views in real life (and from slightly lower vantage points).